Pre-Race Preparation : My race preparation Started the week before drinking plenty of fluids every day as the predicted weather was 30 degrees. To keep my legs warmed up and turning over I ensured to take a long but easy ride everyday up until the race. Pre-Race Thoughts : After riding the corse i was starting to think about my tactics for the best places to drink and overtake during the race. Track Surface : Due to the very hot weather the track was hard , dry and extremely dusty. It also happened to be an all natural course which allowed it to be incredibly bumpy. The track surface also made made myself concentrate considerably harder than on a man made corse as there where little pot holes hidden around. Pre-Race Routine : For me this always starts in the morning about 6 AM where i get my self ready, pack the remaining bits for the car and cook my breakfast. My breakfast consists of porridge with extra large oats and a mixture of seeds on top, over the time i have been racing i have found this to be the best fuel for me as it has a slow release of energy and keeps me going right until the end of my race. It is also quick to make and easy to eat in the on the to the race. Shoes : For the race I decided to wear my Shimano XC5 shoes as the are the lightest pair I have and I thought the would be suitable considering the hot weather. Fluids taken during the race : Fluids play a key part in my performance on hot days as i pour a bottle of water over myself every lap to help keep my self cool i also have a bottle of water on my bike. I drink at least 500ml of this in a race. This doesn’t sound alot but at race pace and on rough track surfaces it can be very hard to drink. I found at Hintlesham I drank 750ml of water. General Observations : One thing I noticed in the race was some riders struggling due to the heat. When we would go past the pits I would grab a bottle of water where as they wouldn’t this started to show on the second lap where riders where dropping back. Things that worked for this event : Dropping a few PSI in the tires to take the bumps out of the surface of the track. Things that didn’t work well for this event : Clip placement on my shoe caused problems for me on the start line as when the whistle blew I missed the pedal two times. Psychological Observations : In racing the worst part for me is sitting on the the start line and the first 20 minutes of the race. Especially at Hintlesham. As we started on a hill it made getting a good start very important. sitting on the the start line waiting for the Whistle to go is absolutely nerve racking as ur mind is trying to predict the unpredictable. Once the whistle did go at Hintlesham I found a comfortable pace and stuck with it for the first lap and a half .I found getting in to a rhythm easy this time around because of the nature of the corse. As I looked down at my Garmin and saw the first 20 minutes was out the way I thought to myself “ the hard bit is out the way “ . Once this is over i like to think about my pace for a minute and either speed it up or slow it down, in this case for Hintlesham i sped up. Post-Race Recovery : My recovery was a simple warm down and a protein recovery drink. 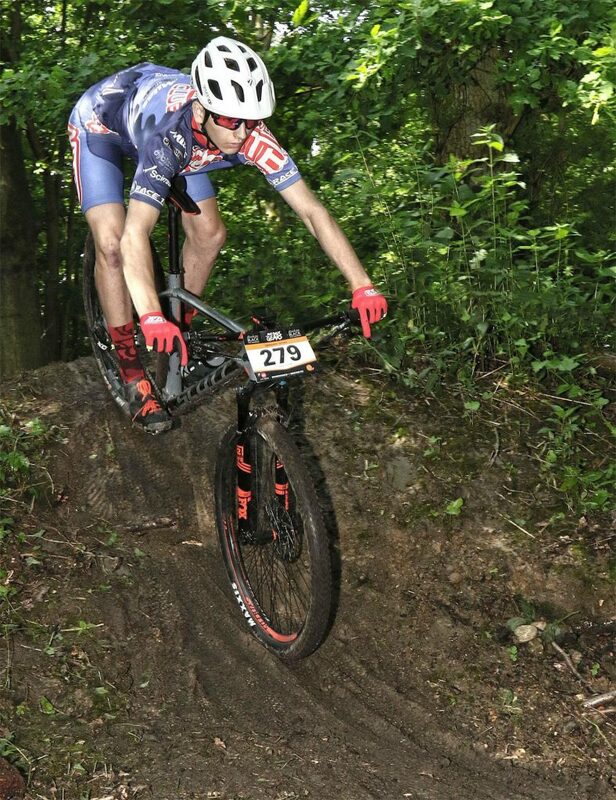 Things to Improve for Next Time : I found my self getting over excited on one of the down hill section of the course. Being a mixture of an “absolute maniac” as my mum likes to call me and a speed demon i pushed the limits going faster every time until I went to fast and low-sided the bike on a corner towards the bottom of the fast section. My Garmin recorded i fell of doing 29.8 MPH and I definitely felt it when I looked over to find no skin on my arm or leg.